Welcome to another edition of “Under the Hood,” our multi-part interview about Forza Motorsport 4 with Turn 10 creative director Dan Greenawalt. If you missed the previous installments in the series, you can get caught up here and here. Today’s edition completes our one-on-one interview with Dan—in our next edition, Dan will be answering YOUR questions about the game. Today we cover a hodgepodge of topics, including a look at the AI in Forza 4, an explanation about headtracking and a new feature that you Forza photographers out there are going to love. What changes have been made to the AI in Forza 4? 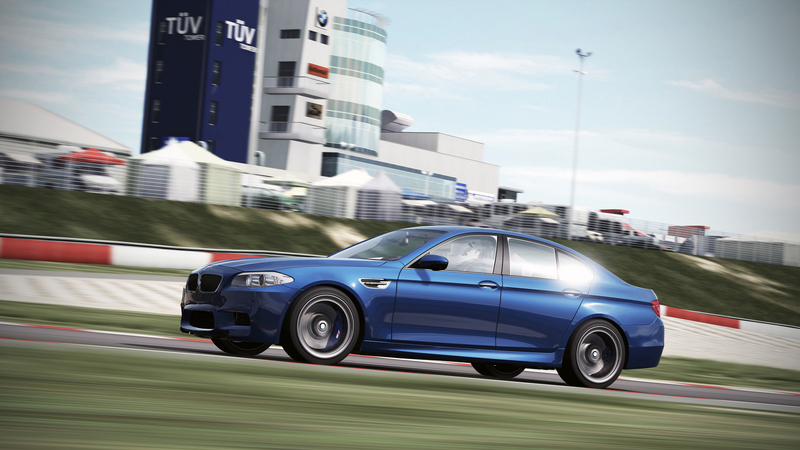 There are several changes to the Drivatar AI in Forza Motorsport 4. And, there’s a lot of backstory here too. As we demonstrated at E3 2011, the AI is more aware of its surroundings than it was in Forza 3. For the sake of brevity (not my strong suit), I’ll limit this discussion to AI difficulty and not go into the whole AI awareness and aggression systems. In Forza 3, we trained the AI to make certain types of mistakes. Then, based on the AI driver profile (i.e. M. Rossi) and AI difficulty setting (e.g. easy, medium, and hard), a given driver might make one type of mistake more often than another. The AI mistakes slowed the AI down, but the results are fairly random. As a result, it’s a good system for giving the AI personality, but it’s not particularly effective at making them consistently slower to account for lower player skill. We also have different aspects to the AI profile that control how well they corner and set up turns–this relates to how the Drivatars are trained to carve lines. This slows them down consistently, but still doesn’t slow them down as much as we needed in Forza 3 for the medium and easy difficulty settings. In order to further slow them down, we removed power from the AI cars at the lower difficulty levels. Removing power slowed them down, but allowed the player to walk away from them on the straights. Unfortunately, this cut down on the nail-biting wheel-to-wheel action. All of these systems in concert created the differences in AI difficulty settings. At the hardest AI difficulty, we greatly reduced the mistakes, instructed them to drive their fastest profile and didn’t remove power. We no longer remove power from the AI to make them slower on the lower difficulty levels. Instead, we gave the lower level AI less confidence going into corners. This makes them brake sooner and carry less speed through the corners. However, once they are at the apex and heading onto the straights, they are flat-out regardless of difficulty level. This has led to far more wheel-to-wheel racing. The key to beating the lower level AI is to take advantage of them in the braking zones and then block/frustrate them down the straights. On the flip side, this does mean the AI on lower difficulty settings brakes very early – so, watch yourself when you’re waiting to pop out of the slipstream. We have several more levels of AI difficulty on the back end driving the system. In Forza 3, we had a total of three levels. Some players felt that the gulf between medium and hard was too great. In Forza 4, we have more than 20 different levels–though these are not discretely selectable by the player. In Quick Race, Event List and Multiplayer, you can choose between four different AI settings. The new player selectable difficulty level basically slots in between what would have been considered medium and hard in Forza 3. The biggest win in having more than 20 different AI difficulty levels is gaining dynamic AI difficulty in the World Tour. In World Tour, the player’s car is limited to specific classes in all events and the AI cars are upgraded (using Quick Upgrade) to the top of the events class limits. This levels the playing field and allows the game to better judge your skill. The game then automatically selects and reselects the correct AI difficulty for you based on your performance over multiple races. It’s like a rolling average across multiple events. All three of these changes together give you incredibly competitive racing. Improved AI is only part of the challenge in the game; there’s also a whole new difficulty level to the game. Tell us about “Expert” setting. All together, these settings give you a 165 percent bonus on your credits in Event List (more than the difficulty settings did in Forza 3). In World Tour, the bottom three settings can’t be changed due to the dynamic AI difficulty system, but they still pay out a credit scalar. Can you tell us a bit more about the new difficulty settings, and how they affect the game? “Simulation Steering” and “Rewind Off” difficulty options are fan requests. “Rewind Off” works like you’d expect. “Simulation Steering” requires a bit more explanation. In Forza 3, we refined a steering assist to the controller (and to a lesser extent for the wheel) that helped the player countersteer, drift and recover. It slightly modified the player’s steering angle input as well as the rate of steering wheel rotation based on the yaw of the car and the player’s recent inputs. I loved the system for drifting, as it made me feel like a driving god without actually sacrificing our physics accuracy. It made the game easier to drift and recover by just interpreting the player’s input. With “Simulation Steering” in Forza 4, those input assists are turned off. If you over-countersteer or over-correct, you will spin like a top. Based on how you drive, Simulation Steering, combined with the new Pirelli tire data, makes the cars feel far more twitchy–especially high-powered RWD cars such as the Ferrari 599 GTO (and even more so with traction control turned off). Interestingly, if you are a very smooth driver that doesn’t really let the car get out of shape, you probably won’t notice a difference at all. Of course, some gamers associate slow steering rates and crazy moment-of-inertia values with a feeling of “simulation.” This is most likely due to their experience with other racing games. However, as most of you know, that’s just not how real cars behave. When you jerk the wheel from one side to the other, the car will twitch. When you over-correct and over-countersteer, the car will build up torque and whip around – hello, tank-slapper. While this is most evident in a lightweight race car, I can tell you from personal real-world experience: it will happen in a big Audi A8 as well! Anyway, simulation is important to us, so we put in the option for “Simulation Steering.” Now that it’s in, I love it. However, I still switch back to the “Normal Steering” setting when I move into some of the more nutter cars (i.e. 599 GTO with no TCS, STM or ABS) or when I’m just looking to drift. What about damage? Anything new happening? Damage (both performance and cosmetic) has been part of the Forza experience since the beginning on the original Xbox. In Forza 3 we introduced rollover. In Forza 4, we’ve made some improvements to the look of damage such as increasing polygonal damage and making texture damage more localized, so where you come in contact with a wall, barrier or other obstacle will be more closely reflected in the damage to your car. Finally, if you play the game with “simulation damage” setting on, we’ve disabled the “auto-rollback” feature—so if you manage to roll your ride after a pretty nasty crash, you’ll be pretty much out of luck. How will car upgrades work in Forza 4? We’ve added various HEV (hybrid) and all-electric cars to the game. In order to enable the addition of these cars, we had to change the physics, audio, Automagic, as well as change the available upgrades. Based on what type of hybrid or electric car it is, and also what kind of transmission it comes with (i.e. CVT), the upgrade system gives you some new hybrid or electric-specific upgrades in the power section. We’ve added a second level of “restrictors” upgrade, as well as some limited tire width options to most of the race cars. In Forza 3, the restrictor upgrade allowed you to remove restrictions on the breathing of the race cars. These new restrictor upgrades sit in-between stock restriction (set by the real-world governing body that licensed the given car) and fully unrestricted. These new levels were tuned to allow the car to get to the top of its stock class in combination with other upgrades such as tire width. In effect, this means that a car like the BMW V12 LMR is able to get to the top of R1 without going into X. For Forza 4, we’ve added a drag racing tire compound. This tire compound has more accelerative peak grip than the racing slicks, but has extremely poor cornering characteristics. Frankly, this compound is horrible to drive on a road course, but launches like a rocket. This compound also wears much faster and reacts to heat differently than the other tires in the Pirelli dataset. Because Forza is an automotive sandbox, we allow you to use this tire in regular road racing–however, you’re probably going to want to change the “damage and wear” difficulty settings to cosmetic. With the proper tuning setup, we’ve been able to use these tires to get wheelstands, but it also requires strong clutch control and car with the “right” center of mass. There have also been changes in the “Aero and Appearance” section of the Upgrade Shop. Most cars with distinct, standalone front and rear bumpers now offer an option to remove the bumpers. For a more period-correct look, specific models receive vintage motorsport-inspired front and rear aerodynamics, and add paintable headlight covers for a race-ready look. Some muscle cars now offer aftermarket drag racing style hood options in both Pro Stock and classic cowl-induction configurations. You’ll also have the ability remove the factory rear wing or spoiler from some cars, and for the ultimate upgrade, some cars allow you to purchase OEM appearance packages available only from the factory, completely transforming the look of your car. While not every car has each of these options, the new options and features are going to open up a new world of customization options for racers, painters, and photographers to experiment with. Moving on to other topics, how did the Kinect headtracking feature evolve? The idea behind this feature has been around for a while. Like me, I’m sure many of you have played with Headtracker IR from NaturalPoint in GTR and other PC simulators. Peripherals like NaturalPoint have been around for nearly a decade. However, NaturalPoint required a hat with reflectors. Kinect is a very sensitive sensor and works without reflectors. It seemed like a no-brainer to use it for headtracking. Because of its sensitivity, it works even with very small head movements (either rotation or leaning). Headtracking allows you to look into the apex and the corner. It does not allow you to look at a 90 degree angle out the window. Basically, it was optimized for hard driving. Also, it’s fully tunable (even in the pause menu). You can map it to be more or less sensitive. You can weight it more towards head lean versus head rotation. We tuned its default settings based on usability testing, but you can change it to suit both your play style and to suit the room in which you play Forza 4. Photography in Forza Motorsport is a big part of the experience for many fans. What’s new for shutterbugs this time around? There have been major changes for photographers in the Forza community. We changed our compression library on standard 1280×720 photos. These are still compressed, but they feature far less artifacting than in Forza 3. We’ve added a photo option called Big Shot. In Big Shot, there is no compression and the file is output at 3840×2160 resolution. Like regular photos in Forza 3, players can take Big Shots during races from the pause menu, from within replays, as well as in the career homespace (more on those below). Obviously, these Big Shot files are huge (click the image above to see a Big Shot at full size). As a result, you can only save a very limited number of these to the server at a time. As with WMV files in Forza 3, your best workflow will be to take a shot, upload it to the server, retrieve it and then replace it with another shot. Because Xbox 360 file I/O is encrypted, there is no support for saving these files in an unencrypted fashion to a USB drive for easy PC retrieval. On the bright side, with no compression and massive resolution, Big Shot produces print quality photographs. We’ve added a new option to select vignette filters to add to the picture. These allow you to add another post effect (like sepia) to your shots without taking them into Photoshop. Finally, photographers can take photos in more career homespace locations. In Forza 3, the career homespace was a special version of the lowest corner of Camino Viejo full. In Forza 4, players can choose from six different homespaces each featuring a distinct look. This collection of homespaces includes the white garage from the E3 2010 Autovista demo, the Top Gear Studio interior recently shown at Gamescom, as well as a new interior space we call the Warehouse, among others.